As I am sure you are aware by now, I am an avid fan of babywearing, infact you can find my review of the Calin Bleu wrap here. So I immediately said yes when Kiddy asked if I would like to review their new baby carrier. Kiddy is a German company that is best known for being manafacturers of children's car seats, they pride themselves on maximum safety, superb comfort and innovative designs. Now producing pushchairs and baby carriers as well, Kiddy continue to wow us with the ideas that they come up with. 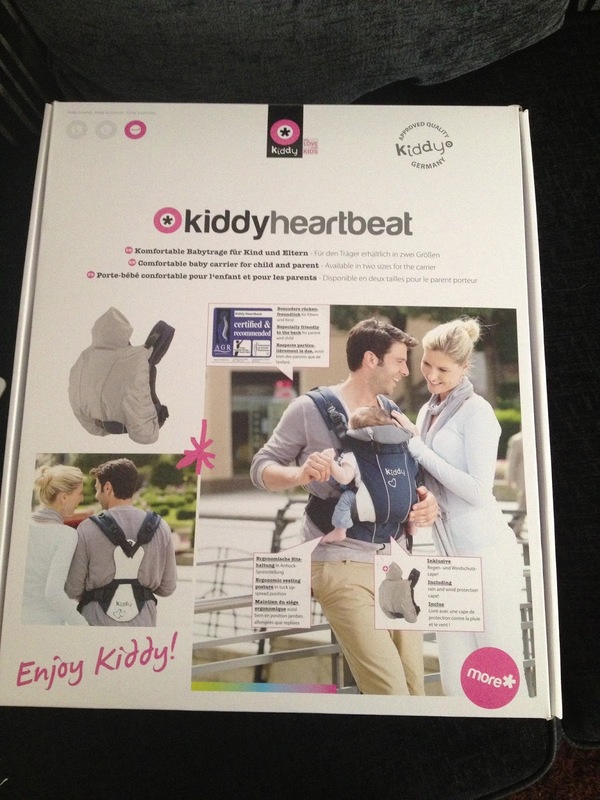 The Kiddy Heartbeat is a 2 in 1 baby carrier, this means that you are able to carry your baby on your front or on your back. It is available in four different colours : denim, racing black, sand and riders club (brown) and in two different sizes, small and large. I received the racing black version in size small, as I am only a tiny 5ft 1. What I loved straight away is that they really think of everyone, there are two instruction booklets purely because they have tried to translate the instructions into as many different languages as possible. This carrier unlike some, can be used from birth when you use it with the newborn insert, which I am happy to say comes included, no need to buy any extras. It is suggested that it can be used right up until your child weighs around 14kgs, this means that you will only need the one carrier, rather than having to purchase another ones as you little one grows bigger. There are so many features on the Heartbeat that really make it stand out from other baby carriers. 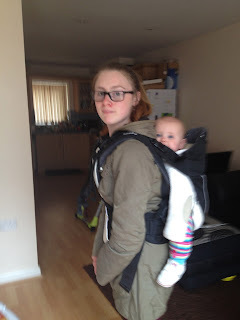 * padded shoulder, waist and back straps : this means that you as a parent are kept comfortable whilst carrying your little one, the strap that goes down the back (or front when carrying on the back), really supports your body and holds you so your posture is correct, I love this, no straining yourself, even if your child is on the heavy side. * padded head rest : this is comfort at it's best, your child remains nice and snug, but the nice thing is, is that there are zips on the front which you can undo and fold the head rest down if your child no longer wants it there. *reflectors : this means that even when out at night or in poor weather, you will be visible to everyone. * newborn insert : giving newborn babies that added support, but also holding them in the correct ergonomic positioning, this insert really is invaluable, wrapping around your little one, keeping them snug as a bug. * intergrated rain cape : hands down the best feature!! 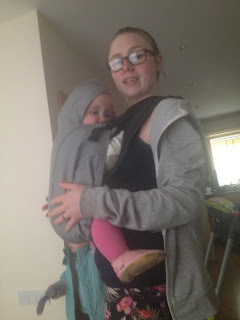 I think one of the main worries when babywearing is what to do when it rains, you don't always carry an umbrella, well worry no more, this cover is cleverly hidden away in a pocket at the front and when clipped in, covers the whole of your child, offering protection from rain, wind and even snow. The picture to the left shows you the rain cape in use. Your child can have their legs out of the rain cape if they wish as shown. This is the front carrying position. Easily achieved by placing the carrier over your head and shoulders. Adjusting the buckle straps before placing your child in and then sitting them in their seat. I did struggle with adjusting the straps at first, I think they were stiff from little use but this isn't such a bad thing as you don't want them sliding up and down freely. Your child is kept close to you but because it is a separate seat, they have their own space as such. I love how wide the carrier is, keeping Layla in the correct "m" seated position, she was very happy to be in there. The picture to the right shows me carrying Layla on my back. Before now I have never been a big fan of buckle carriers when it comes to back carrys as I always found it hard to get baby on my back and correctly positioned. I found this revolutionary. Made a lot easy because you place your little one in their seat before you put the carrier on. You do it whilst your child is sat on somewhere like a sofa. Once baby is safely strapped in, you sit in front of them and put the straps over your head and shoulders. You then do up the wais belt and adjust. The size and style of the carrier meant that both Layla and I were both comfortable and supported, I had her in there for over 3 hours and was left with no discomfort at all and because of how tall the carrier is, when Layla fell asleep, her head didn't roll backwards. With a RRP of £99.99 I don't think you can go wrong with this carrier. In line with the rest of their products, it really is innovative but not only that, it offers both parent and child the upmost comfort whilst remaining stylish, as you would want any accessory to be. With it's breathable material, it is suitable for use all year round and with the added newborn insert and adjustable straps, the carrier really does adapt as your child grows and it is always nice to keep your children close to you as it won't be long before they decided that having cuddles with mummy is just not cool anymore!! I struggle to find anything negative to say about the Heartbeat, the only thing I don't understand is why it is available in two sizes? It is much better to have a one size fits all because I wouldn't want to be buying one carrier for me and one carrier for Daddy Hazelden. Overall I would highly recommend the Kiddy Hearbeat 2 in 1 carrier. It is definitely one to consider, especially if you have never used a carrier before because it is so simple to use. To keep up with all the latest news from Kiddy why not look at their Facebook and Twitter pages. Disclaimer : This carrier was sent to me free of charge for reviewing purposes, hoever all thoughts and opinions are my own. i've had a manduca before and it is quite similar but i found the heartbeat to be more supportive for the parent as well as the baby. both great carriers though!! loving the raincover feature! clever german design ;o) looks like a brilliant carrier! great review!